View of “Peter Regli: One Sun - One Moon,” 2015. The marble Buddha laughs benevolently, luxuriating, on one side. His follower, a worried-looking marble snowman, stares back. He seems to be realizing that he’s got a snowball’s chance in hell at this whole enlightenment thing. Artist Peter Regli cleverly comments on metamorphosis through more than fifty small groups of these knee-high characters. Watching the deities serenely teach their lumpy, half-melted little acolytes is highly amusing—they make such unlikely pairs. Yet, the snowmen become relatable stand-ins for us humans, desperately seeking wisdom and meaning before it’s too late. To tackle the transience of life with so much humor isn’t easy, and Regli’s results are oddly moving. 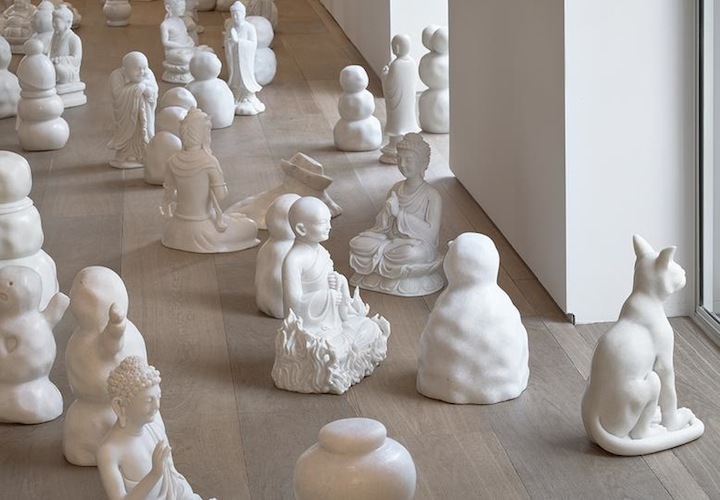 Regli, who refers to this and other projects as “reality hacking,” gave photographs of Buddha tchotchkes, snowmen, and toys to marble carvers in Da Nang, Vietnam, who fabricated the sculptures. Before this commission, the craftsmen only produced a few traditional Buddha types for temples. And they had never seen snow. By introducing this foreign subject matter, Regli seems to be hacking their reality as well as the visual expectations of his viewers. That the statues are all carved in marble highlights their formal similarities—balls of snow echoing bald heads and round bellies—at the same time that it places them in conversation with classical Western sculpture, the slumping snowmen providing comic foils for the idealized bodies of ancient Greece. Their kinship extends beyond medium, though. All sculptures, Regli seems to point out, spring from a common human need to create characters in our own image. From eternal gods on altars to snowmen in suburban backyards, we grapple with time through sculpture, watching some weather the centuries while others slip away with the seasons.